Play the Game of the Month, Builder Beaver, at Springbok Casino and get free spins, free money and double comp points. September’s Game of the Month at the The South African online casino ihas not one but two Free Game features. You'll get 10 free games when three or more Scatters (a Beaver Logging Co. sign) appear anywhere on the reels. Prizes are doubled during the free spins. And you'll get 12 free games when 3 or more wild Beaver symbols appear. Prizes are tripled when Beavers substitute in a winning combination. 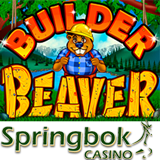 You can play Builder Beaver on your computer but it's also one of the 18 games available at Springbok Mobile Casino for iPhone, iPad, Android and Samsung Galaxy users. Mobile casino players earn double comp points. All kinds of players can enjoy this game since they can bet as little as R0.25 or as much as R125 per spin. Builder Beaver Free Spins: Get 15 Free Spins by entering coupon code BEAVER when you deposit. These bonuses are available until September 30, 2014 only. All transactions are in South African Rands but Springbok Casino welcomes players from around the world.